Bring your product pages to life on your site and make them interactive by adding videos! 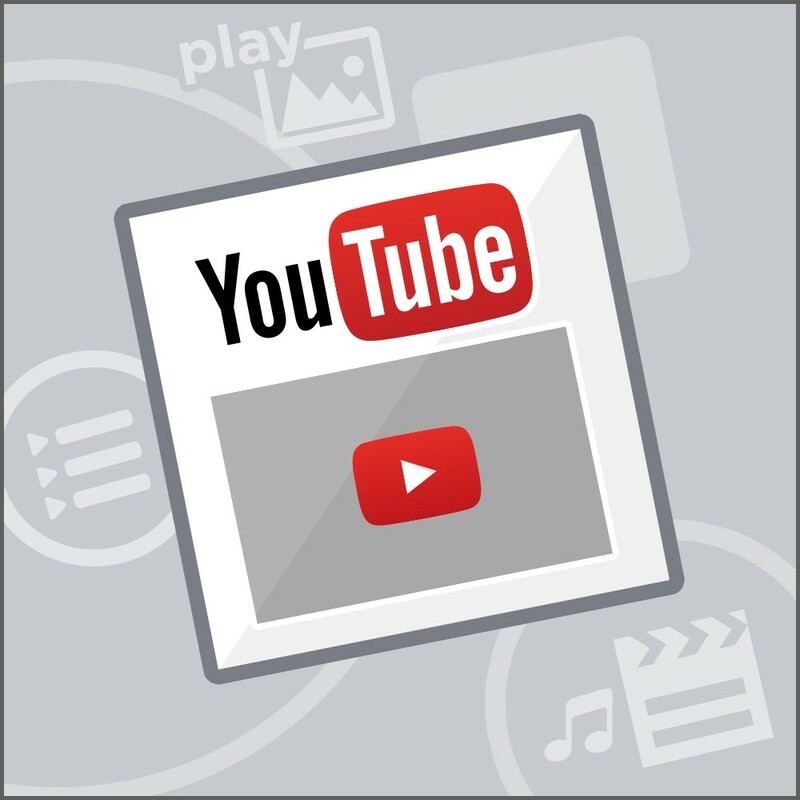 The Product Videos - YouTube module is an ideal way to increase your products’ conversion rate. 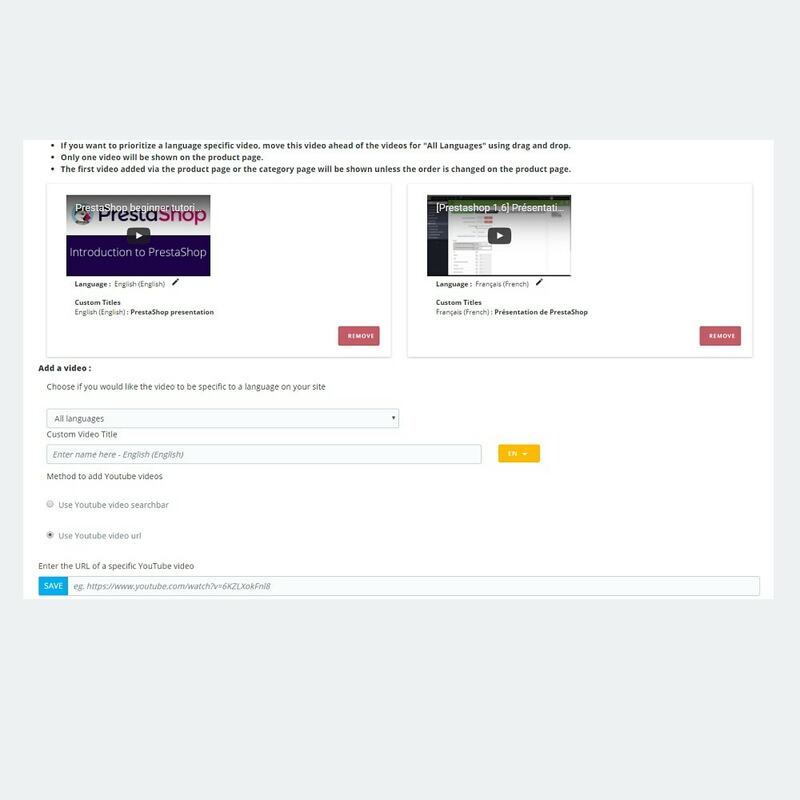 It lets you easily and automatically import your YouTube videos and add them wherever you like on your product pages. Videos are an essential tool to make your products more attractive and improve your conversion rate. 73% of consumers are more likely to purchase a product or a service after they've watched a video. Make your products more attractive by providing your customers with visual and relevant complementary information (features, characteristics, benefits, use, etc.). Increase your conversion rate and reduce product returns. 96% of consumers think it's easier to reach a decision about an online purchase if they watch a video. Easily enrich your site's content and improve your natural SEO by adding YouTube videos to your product pages. Improve customer engagement and increase average cart size on your site. Choose the position of your video in the product pages of your choice (in the left or right-hand column, in the center or at the bottom of the page). 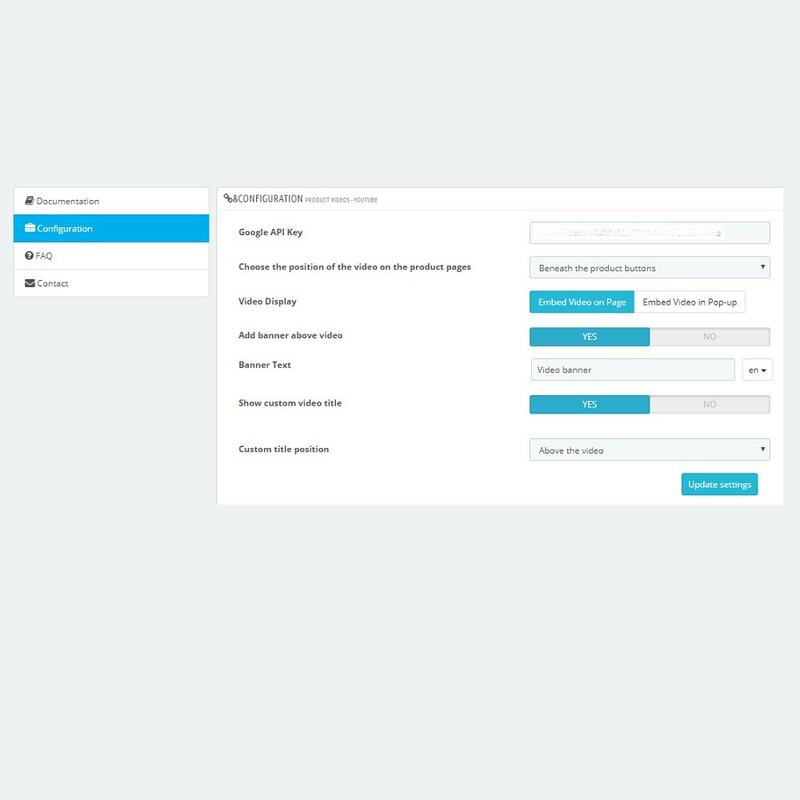 Automatically import a single video of all products of the same category in the category page (only for PS 1.6) or manually upload one video for each product you want in the corresponding pages. 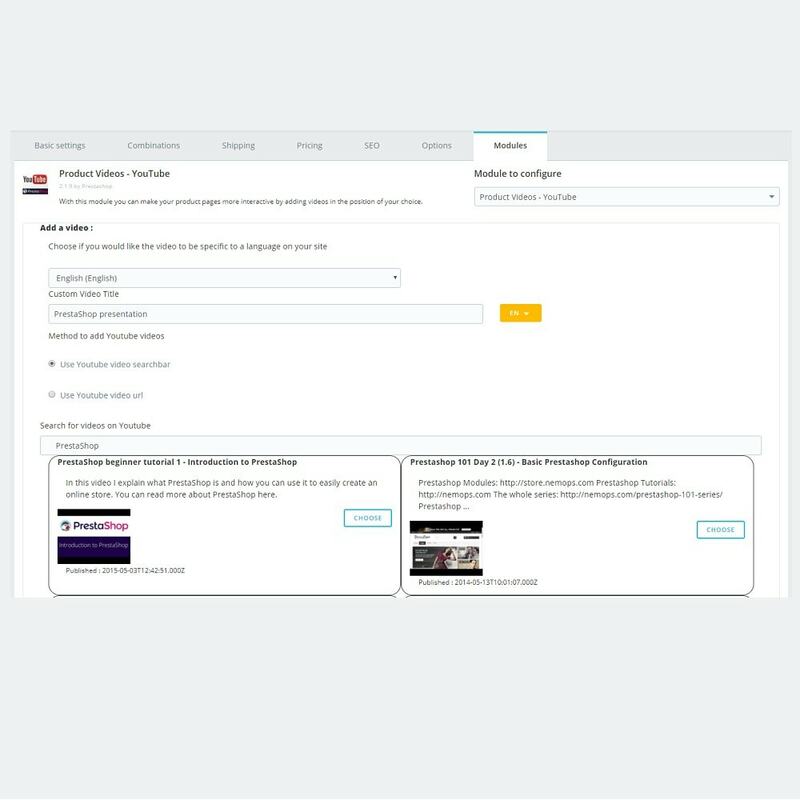 Perform a YouTube search of videos associated with the name of your product, and import the videos you want. 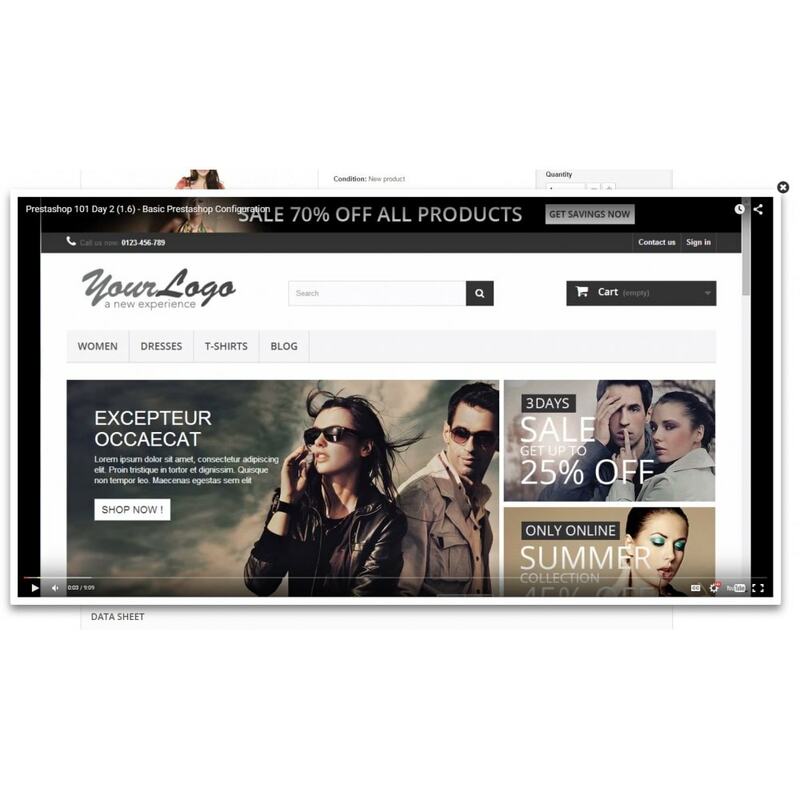 Display your video by inserting it directly in the product page or in a pop-up. Create a legend that will appear alongside the video and provide your visitors with details. This module is ideal for displaying the following types of videos: product and feature presentations, tutorials, usage tips, demonstrations, and more. The left column, right column, and bottom tab displays are only available with certain themes. Information related to the General Data Protection Regulation (GDPR): this module uses an external service, thus its compliance with this European regulation depends on the compliance of the involved service. We invite you to contact Google directly for more information. Will enjoy an optimized presentation of your products. Will see rich content on your site, available in several formats. Can purchase your products with confidence, with videos that ensure they understand your products and how your products meet their needs. Will have a more powerful user experience and buying experience.